Q: How do I purchase a shade sail? apply for Council approvals, etc. 2. Enter into a contract with Sail City to design, manufacture and install the sail. Re-measuring the area to be covered by the sail. 4. We then design and manufacture the sail. 5. Install the sail ensuring perfect fit and tensioning to maximise the longevity of the sail. You are supplied with a sail storage bag and an owners’ manual with instructions on how to take down your sail in winter and reinstall it. You can also view our video. 6. A maintenance program is offered which includes taking the sail down, checking it for any problems and reinstalling it correctly. Q: What fabrics are used by Sail City? 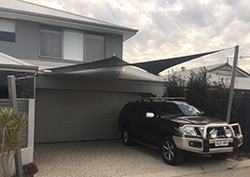 Polyfab Comshade are our standard fabrics. These companies produce industrial quality fabrics and offer a limited 10-12 year warranty (excluding the Dri-Z waterproof fabric which has a limited 5 year warranty). Depending on the colour chosen, these fabrics have UV block-out rating from 78% to 99%. Their websites provided additional technical information on these fabrics. Q: Do you make waterproof sails? 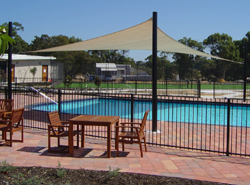 In many residential applications, the waterproof sail will not meet minimum design requirements. Waterproof fabrics do not stretch or allow water to pass through them so the sail requires careful design to stop water from pooling on the top of the sail. Waterproof sails demand a hyper shape or a sail with a large slope. We offer waterproof sails using Rainbow Shades Dri-Z fabric. This has all of the UV and Shade qualities of the shade sail fabric, but with a clear polymer layer bonding. Rainbow Shade and Polyfab offer a large range of colours which they update regularly. The colours are shown in the Fabric section of this website. Q: Will the threads rot over time? Sail City uses only PTFE (polytetrafluoroethylene) thread. This is a long lasting thread that does not deteriorate when exposed to UV radiation and which is used for outdoor and marine products. Cotton based threads break down after a few years’ exposure to the sun and salt. Our threads carry a warranty which is the same as the specific fabric warranty used for the project. 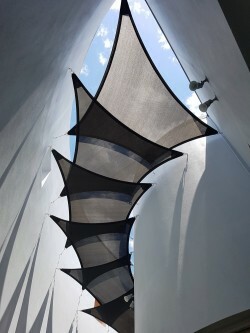 Q: How do I care for my shade sail? take your sail down during the winter months and certainly in strong wind conditions. keep the sail tensioned and check fixtures and fittings annually. We offer a maintenance program at nominal cost to help you increase the life of your sail. Q: What kind of a warranty do you offer? Sail City honours the limited 10-12 year warranty offered by our fabric and thread suppliers. Your consultant/installer also offers a 2 year structural warranty on workmanship and any components used. All of Sail City consultants carry public liability insurance. A certificate of currency can be issued on request. 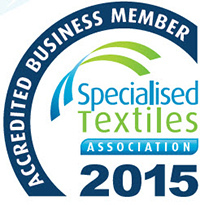 We are also Accredited Business Members of the Specialised Textile Association (STA), the peak body, who have established guidelines for the shade sail industry. Q: Do I need to apply for Council approvals? 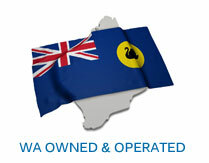 Most councils in WA require a planning approval and a building permit when you carry out works on your private property. They charge a small fee. We can help you organise the approvals. Q: Can you supply me with a DIY sail? We are happy to supply you with a DIY sail, manufactured according to your measurements. We will even provide you with design advice.